Primary Weapons Systems (PWS) is a firearms manufacturer located in Boise, ID. PWS was founded in 2005 from humble beginnings with the goal of enhancing the AK47 platform. They soon moved into the AR market after their initial success, and designed a long-stroke, piston-operated AR platform rifle. This feature, among others, is what sets their MK1 series apart from your standard gas-operated AR-15. The PWS MK1 series guns include Magpul MOE furniture/Gen2 MBUS, as well as an ALG Defense QMS trigger. These are common OEM accessories used industry wide, and are high-quality parts. Next, we’ll cover the real features and enhancements of the PWS MK1 series. The PWS long-stroke piston system found in their MK1 series reduces the amount of fouling entering the action, which increases the reliability of the rifle. I have found that the MK116 stays much cleaner compared to my direct impingement AR-15s after the same number of rounds. The proprietary bolt carrier group features a Nickel-Teflon coated bolt, and the operating rod is attached directly to the carrier. 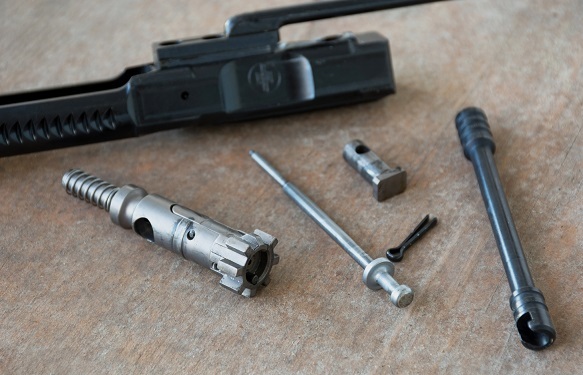 Installation and removal of the bolt carrier group is nearly the same as a direct impingement AR-15. The operating rod is bolted and staked in place in the same manner that the gas key is attached to a standard AR-15 bolt carrier group. The MK1 Mod 1 rifles also feature a detachable piston head. This allows the user to swap out charging handles, and also makes cleaning easier. 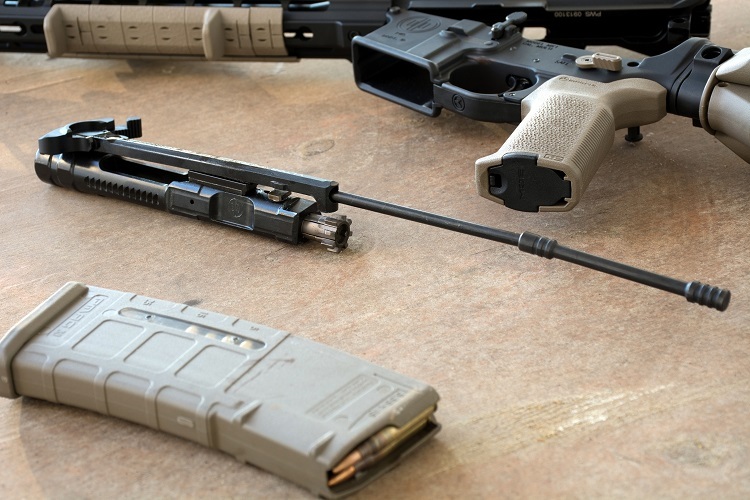 PWS MK1 rifles include a BCMGUNFIGHTER Charging Handle Mod 4 (Medium), which is arguably one of the best available on the market (more on the GUNFIGHTER here). The PWS MK1 bolt is Nickel-Teflon coated, which reduces friction and increases reliability. The carrier is specially profiled with grooves and channels which also reduces friction and areas for debris to accumulate. Although this carrier is Isonite QPQ, the ones in the current MK1 models are now Nickel-Teflon coated as well, which makes cleanup a breeze. Increased weight in the rear of the carrier delays unlocking of the bolt, and increases dwell time. This results in reduced chamber pressure allowing for more consistent and dependable extraction. 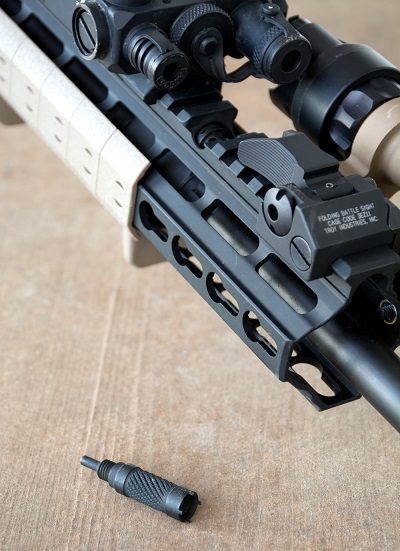 The bolt itself features a small spring which assists in reassembly of the rifle. PWS utilizes chromoly barrel blanks that they profile in house to their specifications. The barrels are Isonite QPQ treated which increases hardness and corrosion resistance. The MK116 features a 16 inch barrel that is 1:8 twist (55-77gr bullets) in .223 Wylde (.223 Rem or 5.56 Nato capable). 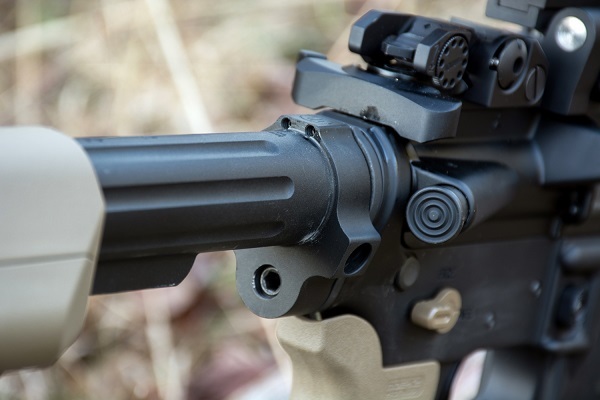 The barrel itself is more of a lightweight profile, and features M4 feedramps. The barrel threads are 1/2-28, and the rifle ships with a PWS FSC (Flash Suppressing Compensator). The PWS FSC works very well at reducing muzzle climb and felt recoil, but it still flashes considerably in low light. I replaced the PWS FSC with their Triad flash suppressor as I wanted to use my MK116 with night vision. The MK1 Mod 1 series include an adjustable gas block with 4 different settings. The gas block itself has an angled chamber, which is designed to help eliminate carbon buildup. Unused gas is vented towards the front of the rifle. 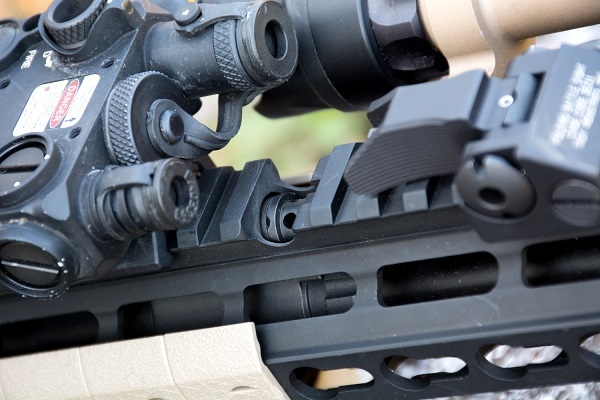 The free-floated handguard has a small cut out above the gas block for adjustment. Included is a gas knob adjustment tool which can be stored in the pistol grip of the rifle. The tool is necessary for gas block dis assembly (note the threads) and also doubles as a sight adjustment tool. The smaller end of the tool is used to adjust the gas block between its 4 settings (a bullet tip also works). The fifth setting is marked by an X, and is used for removing the gas plug with the supplied gas knob adjustment tool. Position 1 – Normal operation with standard and some military ammunition. Position 2 – Higher powered loads such as military ammunition. Position 3 – Suppressed use when using standard ammunition. Position 4 – Suppressed used when using military ammunition. 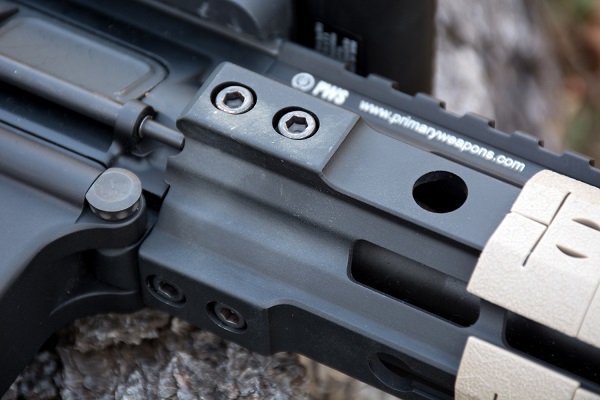 The PWS handguard is extruded from aircraft grade 6061 aluminum, and is hardcoat anodized at Type III Mil-Spec for wear resistance. The handguard is free-floated for accuracy, and has VLTOR KeyMod interface for mounting accessories. The KeyMod interface helps cut down on weight, as the user can choose where to add Picatinny rail section or direct-mount accessories. 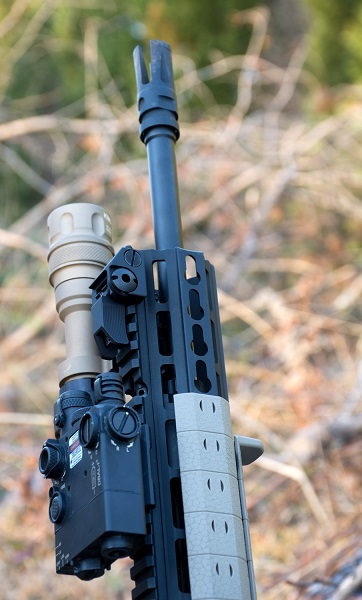 The handguard has a full-length Picatinny top rail, and includes two 2 inch rail sections which can be mounted anywhere on the KeyMod interface. 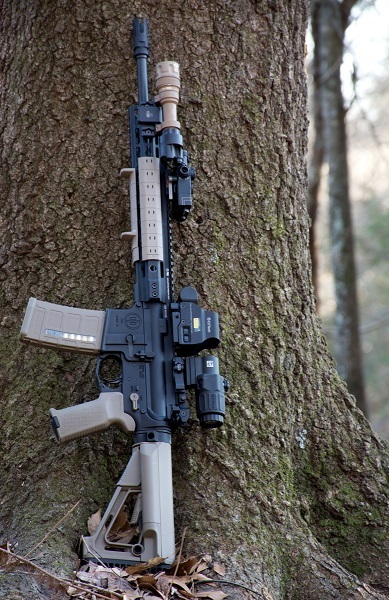 The PWS handguard is a standard AR receiver height, unlike some other piston-operated AR platform rifles that use a taller receiver height such as the HK416. Please note that the newer MK116 have a handguard that extends most of the barrel length and stops just before the shoulder of the muzzle threads. The handguard itself mounts to the barrel nut via 6 set screws and has tabs that overlap the upper receiver, aiding in proper alignment. This design is resilient and I foresee no issues with the rail coming loose or out of alignment from being banged around on hard surfaces. The MK116 has non-rotational QD sling attachment points on either side of the rail just forward of the barrel nut. One of the most significant improvements to the AR-15 buffer tube is the PWS Enhanced Buffer Tube (EBT). The MK116 includes the Mil-Spec tube which is impact-extruded 6061 aluminum. The most notable feature over the standard buffer tube is that the PWS EBT eliminates the need for a castle nut. 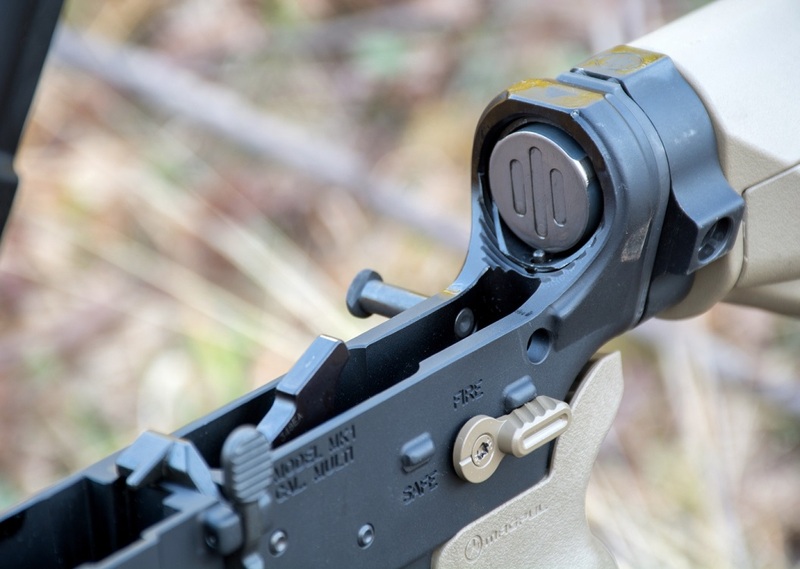 The PWS EBT mounts to the lower receiver via mounting plate and index screws. This ensures the buffer tube is perfectly aligned, and keeps the buffer detent captive. The EBT also has an extra lip which extends into the lower receiver eliminating any worry of carrier tilt. Other important features of the EBT include dual non-rotational QD sling attachment points, and fluting of the tube itself. The flutes in the tube allow debris to clear, and drilled holes allow water to evacuate. The top of the tube itself has numbers if you have multiple users, or change your length of pull often on your adjustable stock. The MK116 ships with an H2 weight buffer (4.5 oz). The PWS H2 buffer is 4140 steel and Nickel-Teflon coated for carbon resistance. It also has reduced contact points which keep carbon and other debris from accumulating. The weight itself is made of tungsten. The PWS logo is machined directly into the buffer for a nice touch. PWS also offers H3 and H4 buffers of same construction if you require a heavier buffer for full auto or suppressed used. The weight classification of the buffer is laser engraved into the side for easy identification. The PWS MK116 Mod 1 has a lot of great features, and it works as well as it looks. This particular rifle does not have a high round count, and it’s only been cleaned once initially and then lubricated with FireClean. The rifle points and transitions between targets easily thanks to the lightweight barrel profile and handguard. When shooting, it has a soft recoil impulse (which I would compare to any properly gassed direct impingement AR), and has reliably fed different bullet weights and case materials. Accuracy with XM193 and XM855 has been more than acceptable, and I wouldn’t be surprised if the rifle is capable of far less than 1 MOA accuracy with a good shooter and ammunition. Ringing steel at 300 yards using plinking ammunition is effortless for this rifle, but like most modern guns, it’s going to be more accurate than the average shooter. 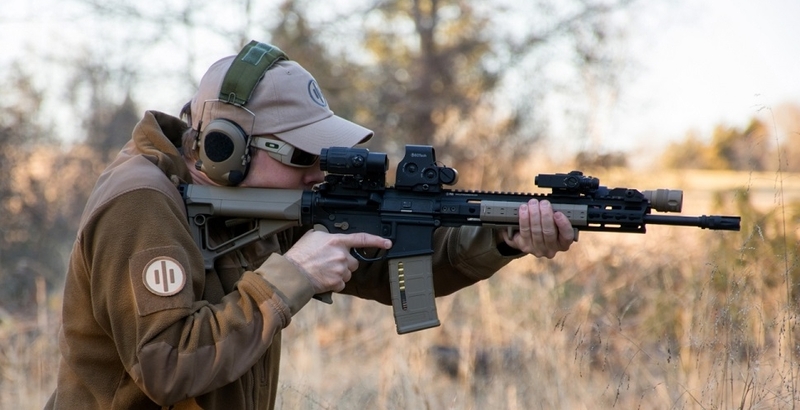 If you are in the market for a piston-operated AR-15 the MK116 is worth a second glance. It’s a great all around rifle that includes a lot of unique features standard. The one negative thing about the MK1 series is that due to its design some of the parts are proprietary. In the unlikely event a part fails you will need to source it directly from PWS or one of their dealers—but the likelihood of that happening is virtually nil. The Primary Weapons Systems MK116 Mod 1 has an MSRP of $1949.95, and can be found at www.primaryweapons.com.